The students also talked about apologizing when they say or do something wrong and forgiving others when they sincerely apologize. Mary Holwerda, school counselor, said it's important for students to realize apologizing not only helps others forgive, but it also helps the person making the apology feel better themselves and let go of the situation. Several student leaders in the panel shared their personal stories about apologizing and then being able to let the situation go and not worry about it any longer. Some of them used "magical" dissolving paper to write out an apology. After reading the apology out loud,, they put the paper in the water, stirred it up a bit, and in an instant, it was gone. 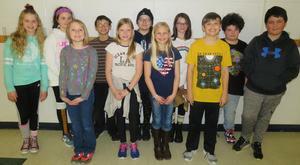 "You don't have to have dissolving paper to let go of things," said Holwerda. "It's like making your apology - a sincere apology - helps the other person feel better and it helps you feel better too." 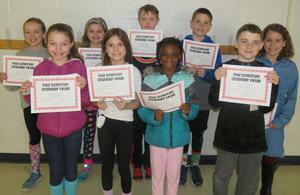 Principal Mike Gelmi reminded students there is nothing wrong with making mistakes and that everyone makes them - even grownups. He said the important thing is to own your mistakes and say you're sorry to someone who may have been hurt. 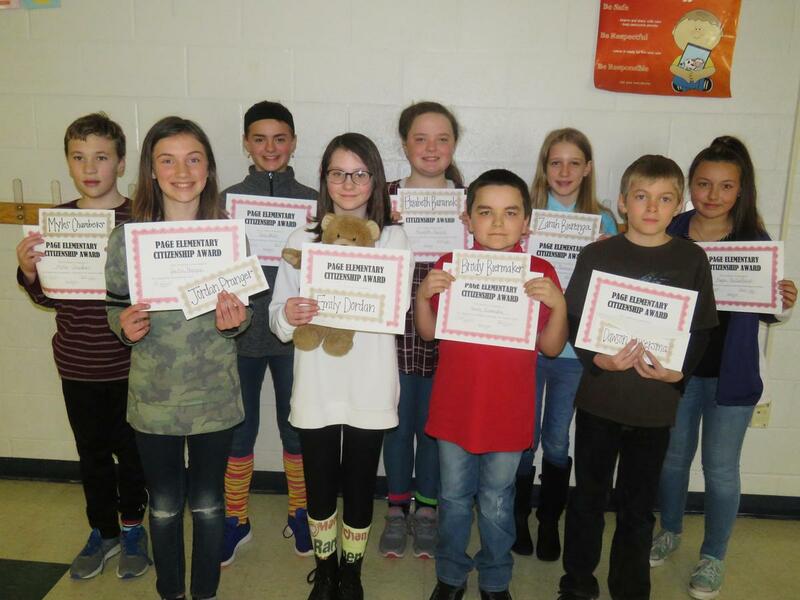 Fourth-grade character trait winners voted on by their classmates were Molly Alden, Emaree Fain, Krysta Fields, Garret Krul, Alaina McCrumb, Leighton Leslie, Blake Riffel, Caleb Chatman, and Lucy Kamps. Fourth-grade student panel members were Sydney Martin, Marissa Rowley, Marcus Barnes, Reece Ritsema, Gabe Klutman, Logan Flynn, Isla Johnson, Austin Hansford, and John Dunkelberger. 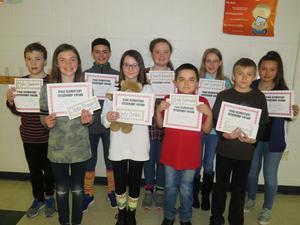 Fifth-grade character trait winners voted on by their classmates were Jordan Pranger, Emily Dordan, Brady Biermaker, Dawson Folkersma, Cami Stahl, Myles Chambers, Elizabeth Baranek, Zarah Bierenga, Megan VanDenBrink. 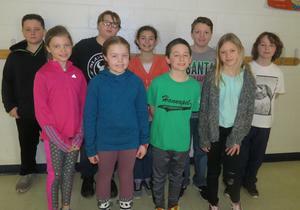 Fifth-grade student panel members were Devon Barnhill, Sienna Schalk, Emma Reil, Luke Archer, Grace Draaisma, Addison Petrak, Landon Brown, Jenna Robinett, Emily Dordan, Jackson Hurless, and Kaiden Rosales.